(NationalSecurity.news) China’s top navy commander told his American counterpart that a minor incident in the South China Sea could spark an armed conflict with the United States if Washington did not stop its “provocative acts” in waters Beijing claims around man-made islands. As reported by Reuters, China’s People’s Liberation Army Navy Chief Adm. Wu Shengli made the comments during a teleconference with U.S. Chief of Naval Operations Adm. John Richardson, a Chinese navy statement said. The talks were held after the USS Lassen, a guided missile destroyer, sailed to within 12 nautical miles of one of the man-made islands in the contested Spratly archipelago last week. The Chinese officially rebuked the U.S. following the patrol – which was telegraphed well in advance, to some consternation among Pentagon officials – the most significant U.S. challenge to date of Beijing’s outsized territorial claims in the middle of what is one of the world’s busiest waterways. In all, China is in the process of building seven artificial islands; Beijing has said they represent sovereign Chinese territory, hence the 12-mile exclusion zone. Other Asian nations in the region, including Vietnam, the Philippines, Malaysia, Taiwan and Singapore – have staked rival claims. “If the United States continues with these kinds of dangerous, provocative acts, there could well be a seriously pressing situation between frontline forces from both sides on the sea and in the air, or even a minor incident that sparks war,” the statement paraphrased Wu as saying. “(I) hope the U.S. side cherishes the good situation between the Chinese and U.S. navies that has not come easily and avoids these kinds of incidents from happening again,” Wu said. Earlier, a U.S. officials said the navy chiefs agreed to continue talking and follow established protocol to avoid armed clashes. 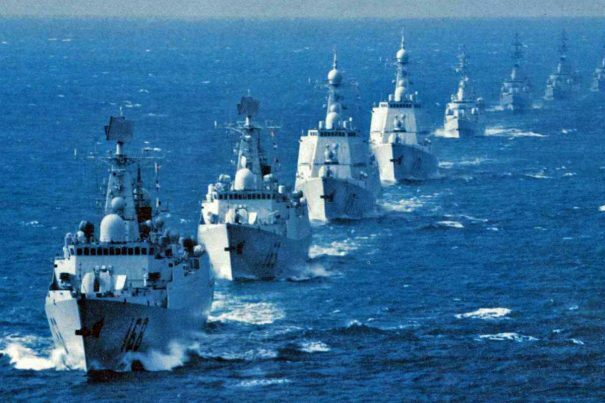 Scheduled port visits by U.S. and Chinese ships and planned visits to China by senior U.S. Navy officers remained on track, the official said, as reported by Reuters. “None of that is in jeopardy. Nothing has been canceled,” said the official. A U.S. Navy spokesman stressed to Reuters that Washington’s position remains that U.S. freedom of navigation operations are meant to “protect the rights, freedoms, and lawful uses of the sea and airspace guaranteed to all nations under international law.” All along, the Pentagon has maintained that American warships – and those of other nations – have long-established rights of navigation in international waters. They have also said that the construction of artificial islands does not constitute sovereign land. As it transited the region, Chinese warships followed the USS Lassen, reports said. There are scores of Chinese vessels in the area. The U.S. Navy is expected to maintain its technological edge for decades to come, say experts. But China’s main trump card is its numerical advantage; dozens of PLAN and Chinese Coast Guard vessels routinely deploy to the South China Sea.